He has called for a new, religious Muslim generation and is building it. He has said that women are not equal to men, imprisoned dozens of journalists, and has come close to starting a new civil war in his own country. Now Turkish President Recep Tayyip Erdogan has a proposal for Europe: We'll take more refugees if you make us members of the EU. To date, Turkey has taken in about 2.5 million Syrian refugees, at a cost of over €7 billion, by most estimates. Europe, by contrast, has given shelter to fewer than 500,000. Now, the EU sits poised to take in millions more – potentially 1.5 million to be settled in Germany alone, despite political controversy about their arrival. Many of those refugees, who are fleeing ISIS in Syria and Iraq, arrive in Europe illicitly via the Turkish-Greek border, making Turkish cooperation in Europe's efforts to stem the tide of asylum seekers critical. During talks in Brussels on Oct. 5, Erdogan expressed willingness to cooperate – for a price. He wants visa-free travel of Turkish citizens through Europe (never mind that such an arrangement would also presumably allow Turkish members of the PKK, a terrorist group, also to enter Europe visa-free); he wants a "safe zone" for Syrian refugees on the Turkish-Syrian border, where they can be settled, if only temporarily, and a "no-fly" zone over the area; he wants Turkey to be named a "safe third country"; and he wants stalled discussions about Turkey's EU membership to restart. The reasoning behind this demand is clear: with new elections slated for Nov. 1 in Turkey and his numbers falling in the polls, Erdogan needs to show both diplomacy and strength. Being designated a "safe third country" would establish (inaccurately) that his Turkey is a democracy. "The EU defines a safe country, to where migrants can be deported, as one with 'a democratic system, no persecution, no torture or inhuman or degrading treatment or punishment, no threat of violence and no armed conflict,'" the Guardian reports. More importantly, getting the EU to bend to his requests would be a sign of his machismo no one could overlook, while sending a signal to his opponents that he is still the man who can best represent Turkey to the world. Then there's the money. Turkey's economy is in freefall. The lira in recent months has hit historic lows against the dollar and the euro (currently trading at nearly three liras to the dollar and 3.5 to the euro). That €7 billion in costs for housing refugees comes to more than ₺25 billion– not insignificant given the country's ₺89 billion debt. EU membership means, of course, not only the possibility of EU currency and monetary exchanges, but EU funds. But the European community, fighting as it is about paying Greece's bills, is hardly about to take on anyone else's. Europeans are certainly unlikely to take up the costs of Turkey's refugees when they are already struggling to find a way to pay for the ones Turkey is allowing to penetrate Europe's borders. And previous concerns about Turkey's human rights record under Erdogan have only worsened in recent years. Exactly what makes Erdogan then think that Europe will welcome his country now? The answer is obvious: ISIS. 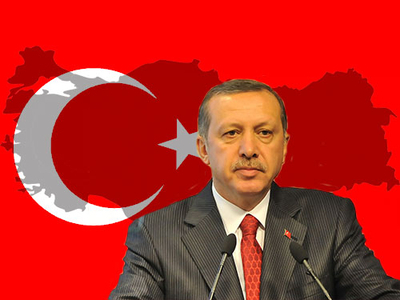 Erdogan wants EU and U.S. support in fighting ISIS and at the same time in deposing Bashar Assad. The EU and U.S. want Turkey's support in fighting ISIS and managing the refugee crisis – a crisis that has ballooned into inter-European infighting, the erection of razor wire fences, and overall political confusion. Europe needs Turkey's cooperation. And it is prepared to negotiate heavily to get it. "The European Union is ready to take up all issues with Turkey," European Council President Donald Tusk said in the Brussels talks. But just how far? With Turkey as part of Europe, ISIS would be fighting on Europe's own borders. Even a perfect Turkish state would have trouble getting into the EU under such conditions. Tayyip Erdogan, however, is accustomed to getting his way, or else. Hence some now are expressing concerns that if he doesn't get what he's asking for, he will simply release hordes of Syrian refugees through Europe's gates. He has, as one Dutch newspaper noted, now handed Europeans a strong and bitter pill. One can only hope they have the courage not to take it.